"Jack-of-all-trades seat that can be used in temporary or permanent situations." "A budget option that actually takes the abuse people dish out on folding chairs." "Mimic the look of cottage-like seats while preserving the convenient storage ability of a folding seat." "More durable and resistant to the elements than other types of folding chairs." "Impact resistance and overall durability with a more modern look." "A standout performer when comfort is the most important thing to think about." "A throne to relax on in the great outdoors." This top performing folding chair is a jack-of-all-trades seat that can be used in temporary or permanent situations. The best quality of a folding chair is utility: the more you can use the chair, the more you will get your money’s worth. The Mity-Lite Flex One fits the bill by offering a durable construction, attractive design, and plenty of comfort for most people needing a great seat. This four-pack folding set provides a unique, high-quality look for otherwise average, temporary seating. Each chair is built with a durable plastic mesh rated to hold up to 1,000 pounds. The design of the seat curves inward with a matching back so the surface ergonomically supports the body for extra comfort. Supported by steel joints, you can use these seats both outdoors and in. Budget-friendly folding chairs are a dime-a-dozen. Since many manufacturers keep prices down by using cheap, substandard materials, it can be difficult to find a budget option that actually takes the abuse people like to dish out on folding chairs. Even average use can wear budget chairs down over time. Thankfully, DLUX has just the right option when price and durability both matter. The DLUX Small is a slip chair that comes individually packaged so you can buy the exact amount you need without the typical excess. Using a round, padded profile, the slender frame of the chair measures 12 inches at the seat and 14 inches up the back. Padded with faux leather and stuffing underneath, this chair provides plenty of comfort despite its small stature. The material of a folding chair influences more than just the durability and overall construction. Different materials create different looks and set the overall tone of the seat. Wood, for example, can create a classic look that balances vintage, traditional and cottage styles with the practical benefits of saving space. Natural wood, in particular, can be quite the looker even on something that is meant to be temporarily seen and used. The Winsome Wood chairs mimic the look of vintage, cottage-like seats while preserving the convenient storage ability of a folding seat. Using a wood-slat design, the chair provides plenty of comfort with a contoured seat and curved back to support the body properly. The surface has a natural wood finish protected with a clear coat to preserve the chair’s look during harsh weather outdoors. Metal is a common construction material used primarily for cost and durability. Simply put, very few materials provide the same high-quality construction like metals such as steel and aluminum. A lightweight metal can also lighten the load during setup and teardown. If you need the most amount of durability from your folding chairs, metal is the way to go. 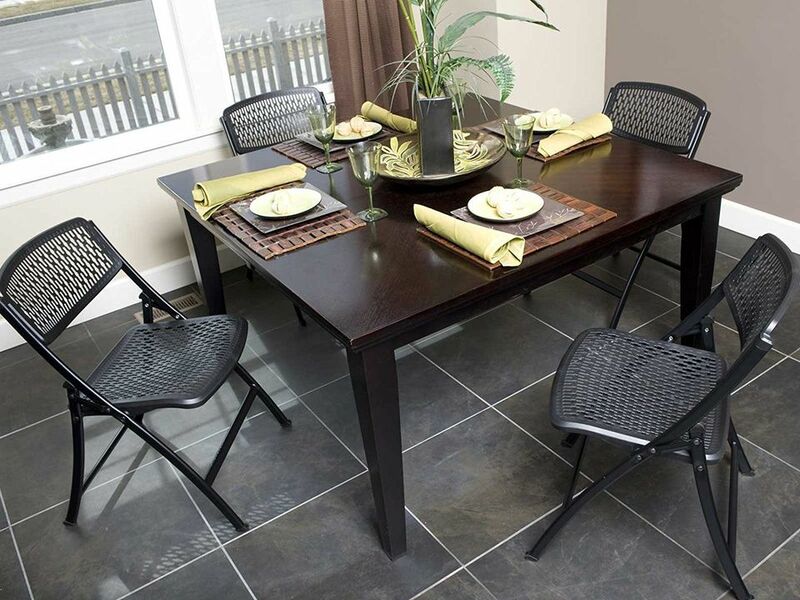 If you have ever imagined a typical folding chair, the Cosco All Steel 4-Pack probably fits the look. An all-metal, dull grey finish hardly stands out in terms of design, but this pack of four chairs gets the job done for temporary seating. Most importantly, the all-metal construction makes these chairs more durable and resistant to the elements than other types of folding chairs. Plastic is a great material alternative over more traditional metal chairs. Depending on the particular type of plastic used, these folding chairs can usually offer the same amount of impact-resistance and overall durability with a different, more modern look. Plastic sets with multiple chairs are also great options for environments requiring a large amount of temporary seating. The Best Choice Products Plastic Set contains an astounding five individual chairs in the set. Each chair is made of a durable, impact-resistant plastic supported by a steel frame and joints underneath. The plastic is easy to clean so you can use the chairs for temporary seating at parties and weddings without ruining them due to food and drink spills. When folded, the chairs stack together to save extra space. One thing that people rarely rave about folding chairs is comfort. Using an all-metal, plastic, or wood construction rarely leaves enough padding to keep the body comfortable for long periods of time. Even chairs with some padding usually only offer less than an inch to support the entire body weight of a person. That is why the Hercules Hinged Fabric chair is a standout performer when comfort is the most important thing to think about. This chair takes the typical, all-metal look of the average folding chair and adds a 2.5” thick layer of padding to the seat and back. The extra padding offers a comfortable, ergonomically supported layer of support for long periods of sitting. The rest of the chair uses a durable metal that can hold up to 270 pounds without issue. Each chair also has four plastic glides to protect the floor underneath while moving the chairs around. Folding chairs are right at home outdoors. Whether you are out camping or just enjoying a relaxing evening in the backyard, having a comfortable, foldable chair offers a great, enjoyable experience for everyone. Unlike permanent patio furniture, folding chairs also offer portability. Find a spot you like, set up your chair, and sit down for hours on end. For the great outdoors, the Coleman Oversized Quad seat will give you a throne to relax on. Using an intricate folding design, the chair collapses down into a tall, narrow cylinder that will fit into the included bag. When unfolded, the chair has a fully cushioned seat and back made of flexible mesh and fabrics. For your drinks, each arm has a single cup holder to keep everything contained and organized.